At L'Orangerie de Beauregard you will have the time and space to relax and enjoy an area of exceptional beauty. With 150 pitches covering an area of 5 hectares there is still a furthur 48 hectares to explore at your leisure, on foot, by bike or even on horseback! All our pitches are large with a minimum of 120 square metres. Choose between our simple pitch or our pitches with electricity, both with water hook-ups nearby to make sure you have all the comfort you need. We can also lend extension leads if necessary. Each family can park a vehicle on their pitch. But you can also park in the car park if you prefer (see map). Dogs are welcome on the site free of charge. Gas and charcoal BBQs are permitted on the pitches. Toilet and shower blocks are open 24/7 and both have disabled access. For that extra special touch choose the Premium Pitch which includes electricity, garden furniture, BBQ, and fridge. 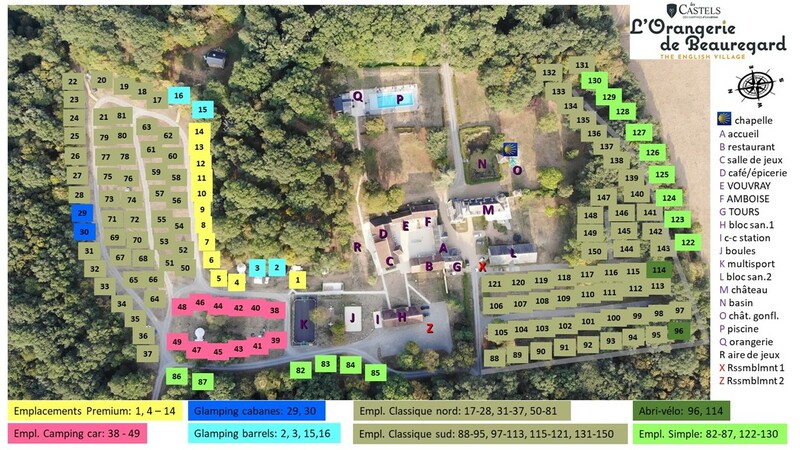 Everything is ready and waiting for you when you arrive at L'Orangerie de Beauregard campsite! Wherever you are take advantage of all the facilities of the central courtyard around which life in the campsite revolves.